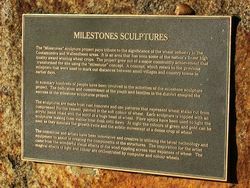 The "Milestones Sculptures" commemorate the significance of the wheat industry in the Cootamundra and Wallendbeen areas. It is an area that has seen some of the nation`s finest high quality award winning wheat crops. The sculptures are made from cast concrete and use patterns that represent wheat stalks cut from compressed fibrous cement, painted in the soft colour of wheat. 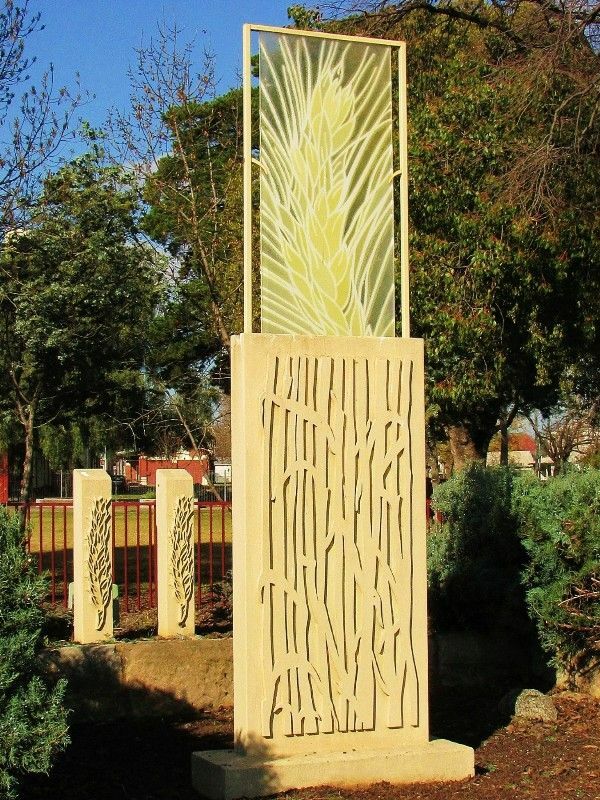 Each sculpture is topped with an acrylic panel inlaid with the motif of a huge head of wheat. Fibre optics have been used to light the sculptures making them visible from dusk until dawn. At night the colours of green and gold can be seen as they simulate the growth cycle and the subtle movement of a dense crop of wheat. 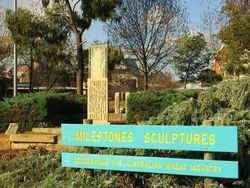 The "Milestones" sculpture project pays tribute to the significance of the wheat industry in the Cootamundra and Wallendbeen areas. It is an area that has seen some of the nation`s finest high quality award winning wheat crops. The project grew out of a major community achievement that transformed the site using the "milestone" concept. A concept, which refers to the previous mileposts that were used to mark out distances between small villages and country towns in earlier days. 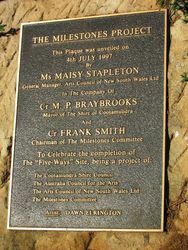 In summary hundreds of people have been involved in the activities of the milestone sculpture project. The dedication and commitment of the youth and families in the district ensured the success of the milestone sculptures project. 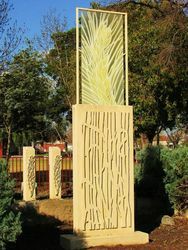 The sculptures are made from cast concrete and use patterns that represent wheat stalks cut from compressed fibrous cement, painted in the soft colour of wheat. 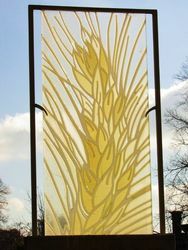 Each sculpture is topped with an acrylic panel inlaid with the motif of a huge head of wheat. Fibre optics have been used to light the sculptures making them visible from dusk until dawn. At night the colours of green and gold can be seen as they simulate the growth cycle and the subtle movement of a dense crop of wheat. The committee and artists have been innovative and creative in utilising the latest technology and equipment to assist in creating the components of the sructure. The inspiration for the artist came from the wonderful visual effects of the wind rippling across vast expanses of wheat. The magical effects of light and colur are orchestrated by computer and colour wheels.